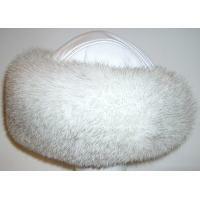 Women's polar fox fur hat handmade of natural Arctic (polar) fox fur and genuine leather. With size adjustment string and pom poms. Ships within 7 business days.